We absolutely loved living in Boston for the past 3 years and exploring all of the amazing restaurants that the city had to offer. We had some of the best Italian food in Boston’s North End, fresh seafood, but there was one thing they were missing…good Tex Mex. As a couple of born and raised Texans, we were always on the lookout for a little hole in the wall Mexican restaurant that could satisfy our Tex Mex craving. We found some pretty tasty food along the way, but nothing could really compare. Here in Alabama we’ve found a couple of restaurants that have come closer to Tex Mex glory, but we’ve pretty much decided that we’re going to have to try to master the art of Tex-Mex at home. 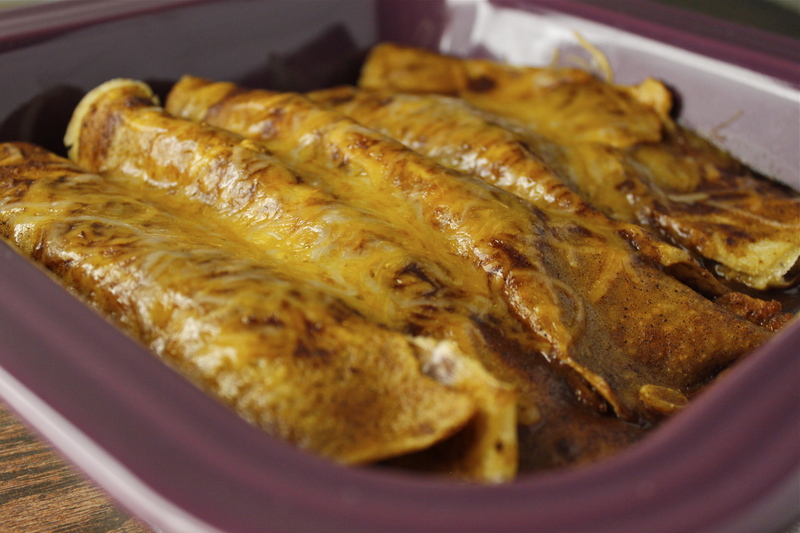 I think that we hit the jackpot with these enchiladas. 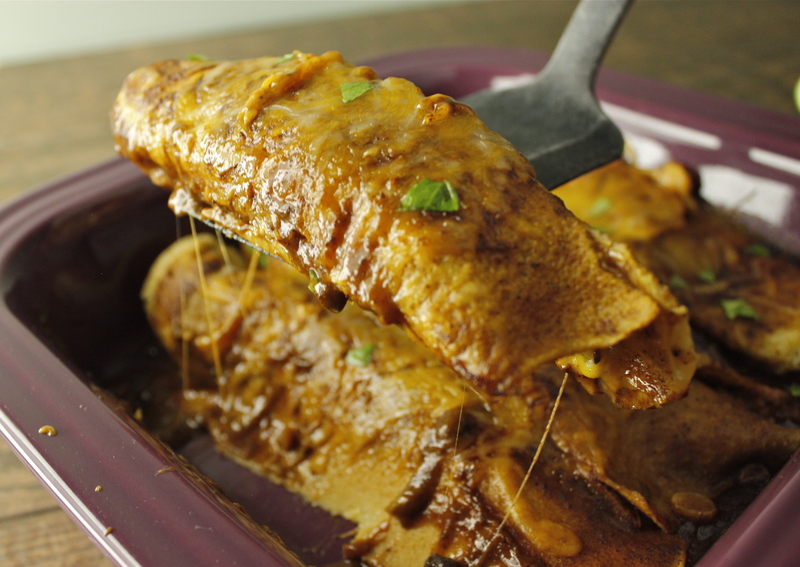 We have fallen for these cheesy southwest chicken enchiladas and life may never be the same again. Homemade enchilada sauce and from scratch tortillas filled with the perfect blend of cheese, seasoned chicken, black beans, and corn. Top with a little fresh cilantro and your taste buds will be in Tex Mex heaven. This recipe is a little time intensive for sure, but the pay off is SO worth it! Scoop batter with 1/3 measuring cup. Pour onto prepared nonstick griddle or frying pan (we spray ours with a little Pam in between tortillas to prevent sticking) and quickly spread using the bottom of the measuring cup or a spatula spreader to make a very thin (approx. 6 inch) pancake. —This is by far the most difficult part of this recipe. Don’t stress about the shape of the tortillas too much and be patient. It takes a few tries to get the hang of it (another reason we usually double the recipe). brown. Cook on other side briefly. Keep warm in covered pan. Heat oil in a small/medium pot over medium-high heat. Add flour and whisk together for about one minute. Mix in the seasonings (chili & garlic powder, salt, cumin, oregano). Slowly add in the stock, whisking constantly to keep smooth and lump-free. Reduce heat and simmer 10-15 minutes (stirring occasionally) until slightly thickened. Spread a little of the enchilada sauce along the bottom of a casserole dish. Dip each tortilla in enchilada sauce or spread a spoonful of sauce on each tortilla before filling. Fill each tortilla with a little of each ingredient in this order: shredded cheese, chicken, black beans, corn, a little more cheese. Slowly roll up the tortillas and place seam side down on sauce. Spread remaining sauce evenly over enchiladas and top with about 1 cup of shredded cheese. cheese is melted and enchiladas are heated through.